I've been playing with the masking technique. It's one of the oldest stamping techniques and I often forget about it. For those who maybe haven't done this technique before, you stamp the image that you want in the foreground first. Then, you stamp it again on a piece of sticky-note and cut it out for a "mask". This mask is then placed on top of the stamped image on the card to keep it from getting inked when you stamp the remaining images in the background. Once the stamping is completed, you remove the mask and color as desired. Simple and yet so detailed. 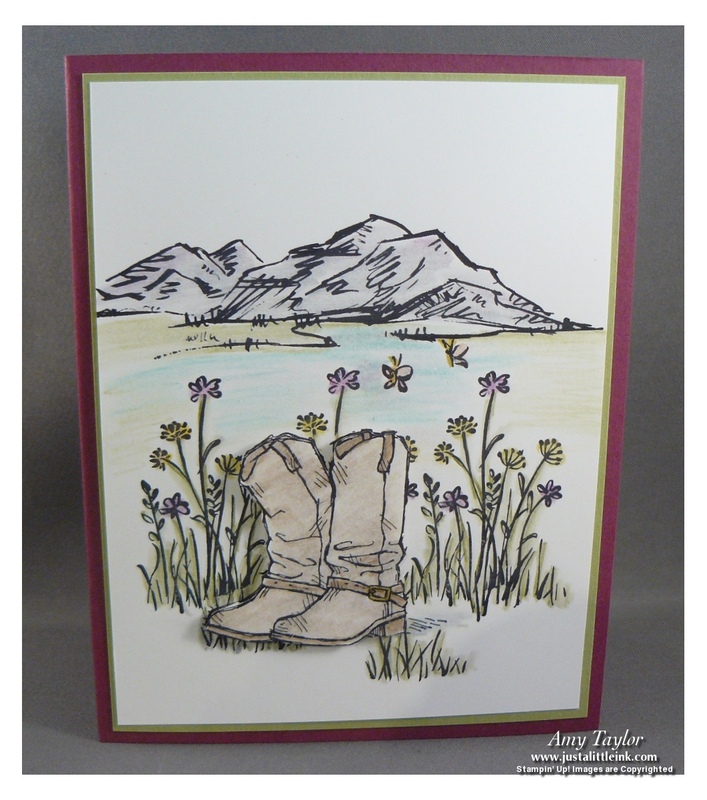 For these cards, I used a set I borrowed from a fellow demonstrator friend called Country Livin' as well as the stamp set, In the Meadow. 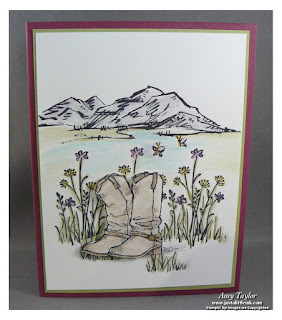 With the boots card, I used the new watercolor pencils and a blender pen. 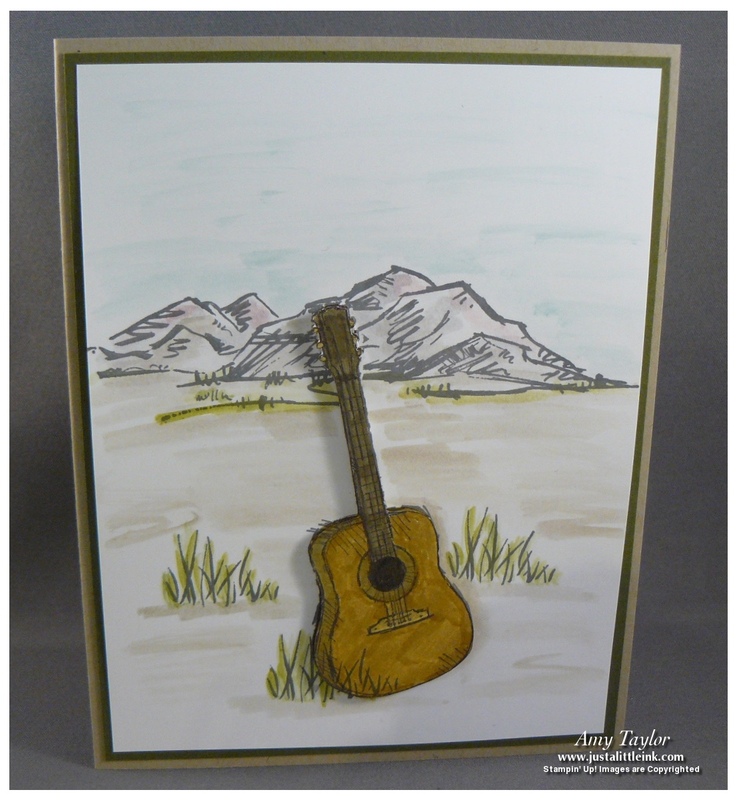 For the guitar card, I used markers and ink pads with a blender pen. In both cases, I stamped the foreground image twice. Once on the card front and again on a separate piece of card stock that I cut out. The cut out layer was then popped-up using Stampin' Dimensionals. From now through March 31st, if you were to purchase both stamp sets and the watercolor pencils, you could pick any one item from the Sale-a-bration brochure for FREE! I hope I've inspired you to go and create!